Aireox air purifiers have been around since the 1970s. This company was one of the first to recognize the dangers of chemicals in the air we breathe. They make air purifiers specifically for people who have Multiple Chemical Sensitivity (MCS). Aireox air purifiers use a combination filter. They combine a HEPA type filter with an activated carbon filter. The HEPA type filter is for dust, pollen, and other allergens. It removes particles down to 0.5 microns. They don't list the percentage of particles removed. For example, a true HEPA filter removes 99.97% of particles 0.3 microns and larger. We don't know if this removes 99% or 90% of these half a micron particles. They also use about 4 pounds of activated carbon. There are two activated carbon filter available. Purafil is potassium permanganate. It does a great job of removing gases from the air. It is found in many top of the line air purifiers. It is only $20 more than the regular activated carbon filter. We definitetly recommend you get this one. There is a good amount of activated carbon. This really works well to remove chemicals from the air. It will remove VOCs, formaldehyde, and others. This machine moves about 125 cubic feet of air a minute. There are 4 air exchanges in an hour. This is the minimum we expect for an air purifier. A room 150 square feet would give us the preferred 6 exchanges an hour. The fan only has 2 speeds. Low speed is very quiet. The puifier is 14 inches high and 11 inched in diameter. In a normal environment your filter should last 1 year. It is recommend that you replace your filter every 6 months. This is to keep Aireox air purifiers working in top condition. So replacement cost could be as low as $80 a year to as high as $200 dollars a year. The Aireox d45 cost about $300 to start with. So at $200 a year that is over half the cost of the purifier just for replacement filters. The reviews we found we positive. Overall we have no huge complaints about Aireox Air Purifiers. We would like to see a true HEPA filter on these. We think that would really improve the efficiency of these machines. We think they are fantastic for someone with MCS. They don't give off any harmful by products. We say if you have MCS give this a shot. It should work great for you. What about asthma. This will be good for someone with asthma, too. Many asthma triggers are chemical in nature and this removes them. Just remember how big of a room to use these in. If you are using them in a huge room they won't work well. Try to use them in a room about 10 X 12 feet. It will work well in a bedroom or an office. If your main concern is allergies, we don't recommend this air purifier. 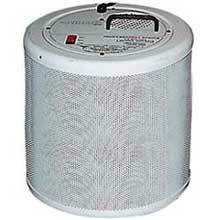 We believe that you need the filtering abilties of a true HEPA filter. You can read more air purifier reviews on this site. Many of these use true HEPA filters.